What's surprising about Californian Ann Hall and HCC Zara RR topping the 2010 Meydan FEI Endurance Open Combination World Ranking is not that they accomplished it. What's surprising is that Zara almost never made a riding horse at all. It was Ann and Hal Hall's son Quinn who came up with the idea of buying another HCC mare while they still could. The Hyannis Cattle Company of Nebraska had produced some outstanding endurance lines in the 1960's through the 1980's, but the ranch is no more; and that breeding had been very good to the Halls over the years in the sport of endurance. Kosciusko, a pure Polish Arabian (a son of Witez II) was one of the first premier stallions of the Hyannis Cattle Company in the 1960's. He was the sire of El Karbaj, winner of the Tevis Cup with Hal Hall in 1974 and 1977, and the Haggin Cup in 1972 and 1978; he was the grandsire of HCC Zarlusko (by Koszar), 5-time Tevis Cup finisher with Hal Hall including a win in 1990; and he was the grandsire of Bogus Thunder (by Koszar), 5-time Tevis Cup finisher with Ann and Hal - four of them in the top ten, and the Haggin Cup winner in 2002. HCC Zara RR's maternal grandsire is Koszar (by Kosciusko). While searching online, Quinn found a 5-year-old mare in Colorado with the perfect HCC pedigree. The mare was indeed hard to catch. It was about six months before the man called and said that Zara would get in the trailer now. He loaded her up with her gelding half-brother, Thunder Cloud - whom the Halls bought as an endurance prospect also - and shipped them to California. "When Zara arrived, I thought 'What was Hal thinking!?' They'd bought her on her pedigree. But she just didn't look like an endurance horse." Plus, they couldn't catch her. 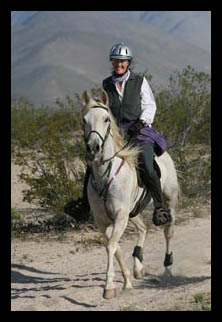 Ann had to leave her wearing a halter with a lead rope attached to have any hope of catching her. Much of her training consisted solely of being caught, and just standing at the tie rack. Over time Zara gradually increased the time she could stand tied by herself. "There was some internal nervousness in her," Ann recalls, and she just couldn't be rushed. And what with their training of Tevis horses (the primary endurance focus of the Hall family every year), Ann couldn't concentrate solely on working with Zara. The result of that was Zara was still pretty much unbroke as a 7-year-old. Hal finally told Ann that she either needed to train and ride her, or breed her, or lease her, or sell her. So in the summer of 2008, Ann and her son Quinn worked with 7-year-old Zara diligently. And finally, "One day, you could just see her go around the turn. Quinn did such good ground training with her, schooled her so well, that when we sent her off to trainer Mark Schurman, in January, he got on her back the next day; and she did her first endurance ride 8 weeks after that." Zara completed 6 of 7 rides her first season, 2009, including the Eastern High Sierra Classic 50 miler, in her fourth ride, carrying Hal for the first time. In fact, the morning of the ride was the first time Hal had ever sat on her. 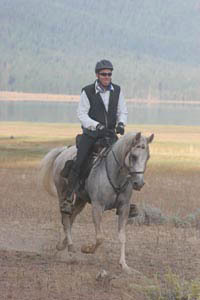 "At the vet check at 25 miles, Hal looked worse then he does after he finishes Tevis!" Ann recalls. "He couldn't slow her down! His knuckles were sore from bracing his hands against the pommel of the saddle." Instead of pawing, like some horses do when they're nervous, Zara paws when she's mad. She'll strike out with a front leg waist-high, and slam it down to the ground. "She was doing that at the trot because she wanted to pass horses!" Eventually by the second loop she'd calmed down somewhat, and Hal and Zara ended up finishing 4th and winning Best Condition. 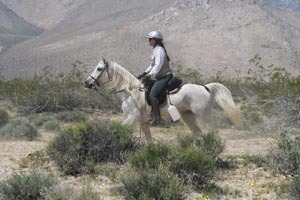 Zara's first season also included a completion in the AERC National Championship 50 with Hal - her first FEI 1-star ride. In 2010, Ann's goals were not to race, but to get through the FEI qualification system, and finish all their rides in the West. She thought they'd try for the list of FEI combination horse and rider: "I looked at what it would take to accomplish it and made up a schedule. 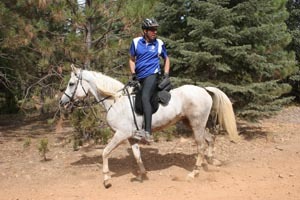 The goal of top FEI combo coincided nicely with Hal's and my desire to support the FEI competitions on the west coast and support the ride managers that take on the extra work and financial risk." They accomplished exactly that, completing the CEI** Git R Done 75 miler, the Sun City CEI* 50 miler, and two CEI*** 100-milers - the Git R Done (finishing in 6th place), and the Patriot's Day at Lake Almanor (in 4th place), and the Desert Gold CEI** 75 miler (in 3rd place). Nine for nine in 2010, and sitting atop the World pair Ranking (HCC Zara RR also ranked 9th on the Meydan Open Horse World Ranking), the little mare still does not look like an endurance horse. "But she overcomes her looks. That's the most exciting thing about endurance - a horse breaks preconceived boundaries of the rider." Bogus Thunder was always Ann's Perfect Horse. "He makes my heart smile. Having Bogus in the barn has been a wonderful experience and I am so grateful for the opportunity to have been able to ride him, and for me he has been the perfect horse. I know endurance riders dread having to bring along a horse to replace that special horse and I was no exception. When I looked at Zara, I just did not expect that I would like riding her so much. "It used to take 4 people to catch her; now she's a pocket horse. She's so much fun! I love riding her. She's very strong and very determined. I find myself giggling sometimes while riding her." Zara likes to go, though with experience, she's more amicable to being paced. And Ann's still not in a rush. "I love bringing a horse along and developing them. Making a good horse takes so much time! Last year I didn't want to find her reserve, so I rode conservatively. My goal this year, 2011, is to have fun. Maybe I'll try a little speed in training, and see how she does. But at any speed, I look forward to seeing how Zara does. It's going to be fun!"